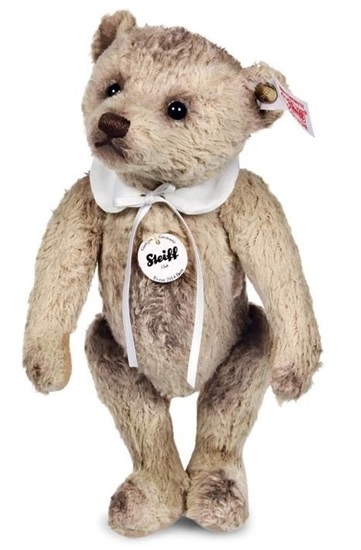 Limited to the year 2014, this 8 inch teddy bear is made from a high quality silk plush..
Meet Bert, an endearing teddy from Steiff's Worldwide Limited Edition Collection. Bert is 8 inches tall, and is made from a beige colored artificial silk plush with wool felt paw pads. Delicate airbrushing brings life to his face, which features a hand stitched nose and mouth reminiscent of wood or earth. To finish, a simple ribbon tied Peter Pan collar. Bert is also a commemorative piece, just like Chestnut, he celebrates the 110th anniversary of Steiffs legendary - button in the ear - trademark. He wears a special gold-plated button.He is fully jointed and is surface washable.